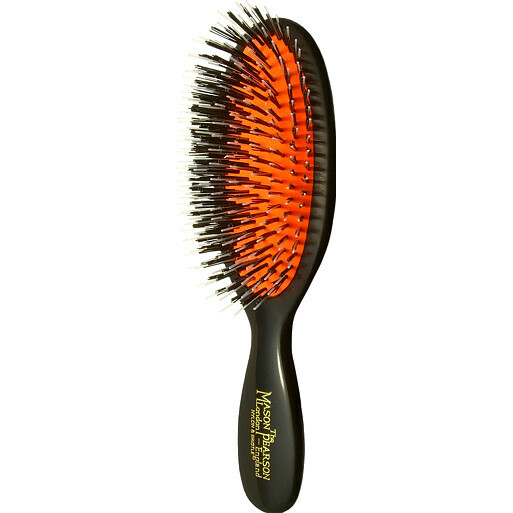 This boar bristle and nylon mix brush is best for normal to thick hair, with 5 rings of pure bristle and nylon tufts to stimulate blood flow to the hair roots. The density of the bristles allows conditioning sebum to be more evenly distributed from the roots to the ends of the hair. Mason Pearson Brushes Bristle/Nylon Pocket is rated 4.9 out of 5 by 13. Rated 5 out of 5 by SJRob from The Rolls Royce of hairbrushes Mason Pearson makes lovely hairbrushes that last - and for me this justifies the investment. I have different sized brushes, some of which I've had for decades, and the pocket brush is perfect for your handbag. Rated 5 out of 5 by Lolz from Well worth it Was sceptical at first paying more for Mason Pearson brushes, but bought one last year and quality is just so much better than other brands, so decided to add the small pocket one to my collection for my handbag. Cannot fault quality, you get what you pay for! I went for pink as I would see it easier in my bag instead of rummaging for black one! Rated 5 out of 5 by RLove from Best Brush I've Used Buy it. Now. I find that the pocket size brush is the perfect size and large enough for my head for everyday use. I wouldn't want a bigger one. If you have thick hair, or even fine hair (but a lot of it), and you want the brush to be able to penetrate your hair and stimulate your scalp then go for one that's a bristle/nylon mix. I love mine. It makes my hair feel so soft and smooth - I noticed that from the first use. I brush my hair from the front and then tilt my head forward and brush my hair from the back and it gives my hair volume and look like I've blow dried it. Pricey, but when you think about how long it lasts and the quality of brush, I'd say it's so worth it. Rated 5 out of 5 by 7petals from Long Hair Essential Not the first time I've bought a Mason Pearson from Escentual. This purchase was a handbag size brush so I don't have to take my BIG one on my travels. I seriously wonder how people with long hair manage to remove tangles without a Mason Pearson. I've had several over my lifetime and I and my daughters would use nothing else!